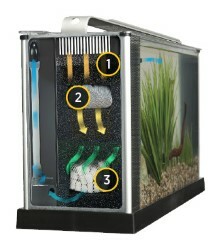 Fluval Spec is a contemporary-looking aquarium designed for small areas such as desktops and countertops. 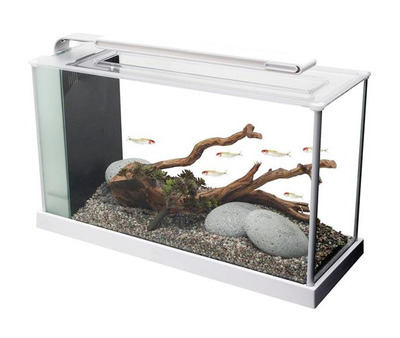 This 19-litre etched-glass aquarium with aluminium trim combines style and functionality in one small package. Though small in stature, Fluval Spec is big on features. It comes with a sleekly-designed overhanging lighting system, consisting of 37 powerful LED lamps, that arches above the aquarium to provide brilliant illumination for plants and decor. The aquarium includes a powerful circulation pump with adjustable output nozzle and a large 3-stage filtration system that provides more than enough filtration for ultra clean and clear water. It also comes with all the necessary filter media: a porous foam block with convenient handle, activated carbon, and BioMax bio rings for effective and thorough mechanical, chemical, and biological filtration. The pump and filtration system are conveniently located in a separate chamber at one end of the aquarium to simplify maintenance. Powerful energy-efficient LED lighting is specifically designed for optimal plant growth and fish colours. 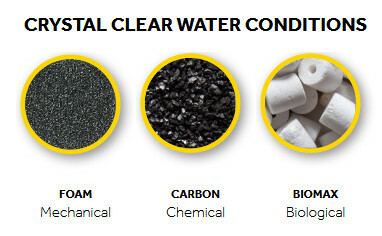 Powerful 3-stage filtration with oversized Mechanical, Chemical, and Biological media for optimal water clarity.